Macau is known to have some of the best Cantonese restaurants in the region. And after living here for nine years and trying many – I absolutely agree. 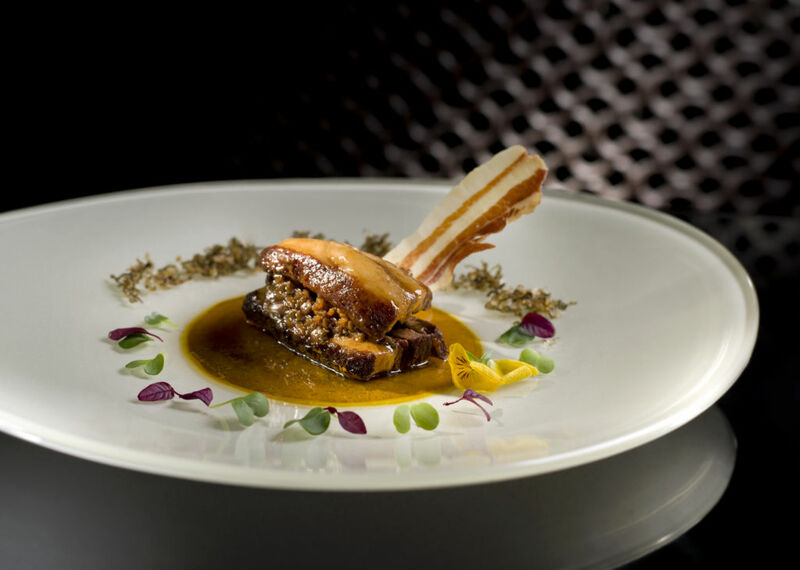 It’s no exaggeration when I say that you have to visit Lai Heen at The Ritz-Carlton, Macau, which was recently awarded a Michelin Star for the second year in a row. You may not be a devoted follower of Michelin ratings, but let me assure you that they are usually very accurate. 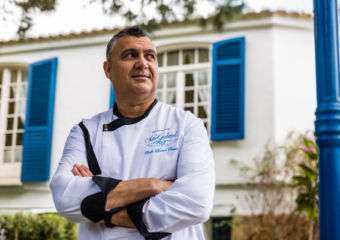 According to the Guide, One Michelin Star is promising high quality cooking, distinct flavors and excellent service. Lai Heen restaurant has it all, and more. Lai Heen is located on the 51st floor of The Ritz-Carlton, Macau that is also part of the Galaxy Macau, the grand integrated resort in Cotai. When you arrive to the lobby of the hotel, you will immediately feel the special ambience, majestic in a certain way. That’s right – this is The Ritz-Carlton Hotel, the definition of elegance and finest hospitality. You will then be greeted by a welcoming hostess and escorted to the lift: “Enjoy your lunch, Miss Katya” – she says with a smile. And my excitement grows. This is not my first time in Lai Heen, but every time I come it feels special. 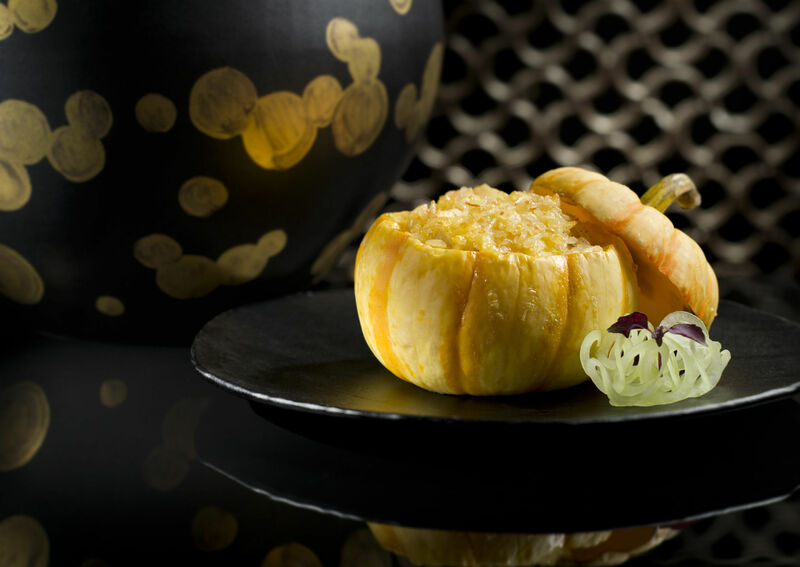 In fact – just a dining experience in Lai Heen is a special occasion of its own. We arrived to the 51st floor in, what seemed to be just a few seconds. We passed by The Ritz-Carlton Bar & Lounge and arrived to the restaurant. It is absolutely stunning. On the left hand side, you will see the windows pouring the brightest light in offering completely undisrupted view of Cotai and the Grand Resort Deck of Galaxy Macau. It is the 51st floor, which makes Lai Heen the highest Chinese restaurant in Macau. The interior is a fantastic blend of art, craftsmanship and space. The corridor is decorated with ceramic vases and its walls are embellished with beautiful designs crafted from thousands of pieces of Azulejo ceramic tilework. On the right hand side, there is an impressive glass structure displaying an exquisite wine collection. 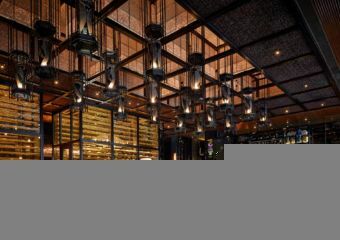 But the most magnificent is the dining area exuding luxurious dark wood and stone complimented with ceramic elements and elegant pendants suspended from a four-meter high ceiling. 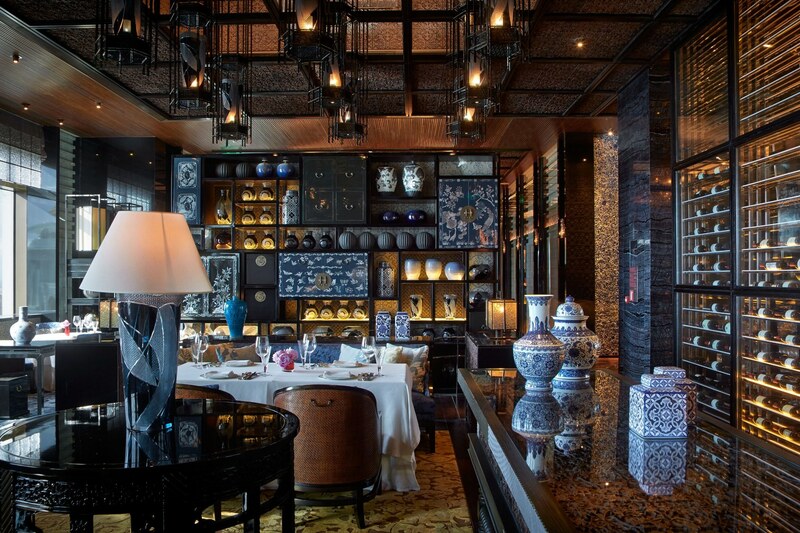 The interior of the restaurant celebrates Macau’s heritage, both of Chinese and Portuguese. We noticed that the restaurant is full, but it doesn’t feel crowded. It retains an intimate vibe and I can imagine coming to Lai Heen for a romantic dinner – it’s simply perfect. There is an area with round tables that is divided with tall Chinese carved wooden panels, for a more intimate experience. Just spend some time getting around the restaurant: it’s a work of art in itself and certainly one of the most beautifully designed restaurants I have ever been. Dining at Lai Heen is a challenge, but in a good way, as there are so many dishes on the menu we’d want to try. 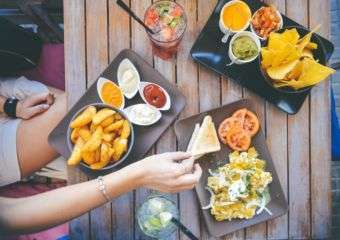 But the attentive waiter makes it easier, she explains that the Chef designs the menu based on the freshest seasonal ingredients and we can try signature dishes as well as some of his latest creations. It is lunch time and, as it goes in Cantonese dining culture, we started with Dim Sum. The trio of Dim Sum creation arrived to the table: a Baked Abalone Tartelette, Steamed Shrimp Dumpling and a Crispy Spring Roll. It’s a curious mix, you might think, but that’s exactly what Lai Heen’s Executive Chef Bill Fu is famous for. With over 25 years of culinary experience, Chef Bill ensures that every single dish is meticulously prepared to exemplify the highest standards of luxury Cantonese dining, but always gives it a personal twist. 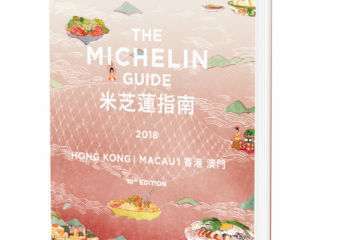 The Michelin Guide was convinced right away, awarding the Michelin Star to Lai Heen just over a year after its opening. The Char-Grilled Barbecued Ibérico Pork came next. For this signature dish the upper part of the pork shoulder is used, where the texture of the meat tends to be more tender. 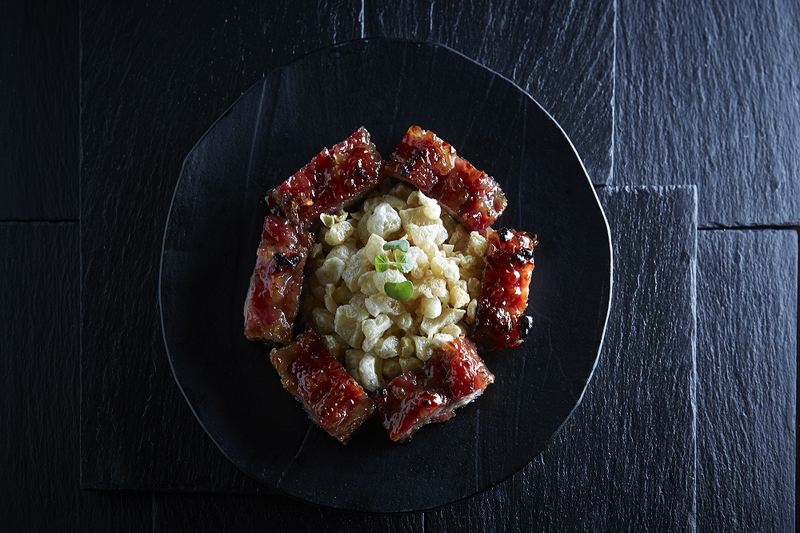 We try it with a piece of crispy rice and the combination is simply brilliant: the pork melts and the rice cracks! Next is Chef’s Special Braised Pork Belly with Preserved Vegetables (see featured image on top). Known as a classic Cantonese dish, Chef Bill took a risk and deconstructed it, presenting it in a modern interpretation with dehydrated deep-fried mui choi. It is delicious and surprisingly light, so we finished it by savoring the last bit of the sauce with some steamed buns. The last main course was the Baked Crispy Fried Rice with Seafood in Baby Pumpkin. The sweetness of the pumpkin, crispiness of the rice crisps and chewiness of the fried rice together with flavors of fresh Hokkaido scallops and sea prawns created the luxurious sensations for my taste buds. To complete the meal we had a dessert platter with a selection of four bitesize Cantonese delights. A perfect ending to a perfect meal. We’ve lost track of the time and it was time to go. If you are not in a hurry though – stop by The Ritz-Carlton Bar & Lounge next door, which I am also a fan of. But, that’s another story.